Michael Suddard: YRT asks "Whats yo number?" YRT asks "Whats yo number?" Isn't it weird that a transit agency would want to know your number? That is exactly what the marketing geniuses at York Region Transit and VIVA want to know. No, not your phone number or pant size numbers, your "Bus Stop Number". (The blue number in the top right hand side of the sign in the picture within this post). This number will enable riders to find out when the next five buses will arrive at the stop and will also be incorporated into their route planner. 1. The YRT website going down even more than the year before. 2. The VIVA displays that tell the customer/rider when the next VIVA bus will arrive have either stopped working or malfunction (i.e. bus arrives at stop and the VIVA display shows the bus is still 20 minutes away). 3. The VIVA displays did not deal with the new time of year from the change to daylight savings time. This change forced the VIVA displays across the transit network to go down. Even when YRT fixed these displays, this meant two of the four routes (VIVA Purple & VIVA Blue) were delayed by two minutes on average. This meant if someone was trying to connect between the VIVA Purple at York University to go south to Downsview Station, they had to wait the full fifteen minutes because the rider would see the VIVA Orange pull out just before the VIVA Purple arrived. Before the time change, the VIVA Purple would arrive about three minutes before the VIVA Orange arrived, making the transfer convenient. 4. The news and information screens on board the VIVA buses are notoriously providing bad information (e.g. the time is wrong, the temperature displayed is wrong, the entertainment information is grossly outdated, etc.) or just malfunctioning (e.g. Windows XP toolbar is showing, Windows XP computer error is showing, high pitched scream is heard as the screen restarts, no power to the screen, etc.). Even better is when the screens are functioning properly, yet the bus is "Not in Service" (i.e. not picking up passengers). With the above technological issues in mind, how can YRT and VIVA claim, in their Winter 2006/2007 Newletter, that the increased fares were for improved technology? The transit planner still hasn't even been launched yet and probably won't be until, by my estimation, early May of this year. 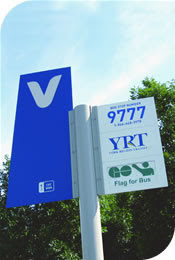 Yet, YRT is already trying to get free advertising with the marketing plan of "What's Your Number?" However, perhaps if YRT had saved their investment in time and marketing and spent their time on taking a look at Google's offer. Roomers have abounded on the Internet that Google had offered to do the transit planner for free. All Google needed was the routes and route times from YRT. But YRT wanted to maintain proprietary ownership over the transit planner. This despite Google offering to do it for free and use its own Google Maps software to show the route and time points. Google has already done several cities transit planners quite successfully. But YRT, apparently will have none of it. Now YRT is launching this marketing campaign in order to get people to take pictures of themselves with their bus stop signs. VIVA will hand them an $85.o0 monthly bus pass and then turn around and use the pictures to market YRT & VIVA in newspapers and probably on television. So they bought free photography and models for a total charge of $85.00 instead of having to pay an advertising company mucho buckos to promote it. Sounds like YRT and VIVA loves to save money at least! But the real question on the numbered signs is will the transit planner tell you when the next VIVA bus will show? This will especially be intriguing considering YRT and VIVA claim these buses arrive every ten to fifteen minutes and do not operate on a schedule. So the question is, how will the planner know when these buses will arrive? Considering VIVA is the 'backbone' of the YRT system, VIVA times and routing will be an essential component of the transit planner. Riders will only find out how well YRT and VIVA have done on the transit planner until it is launched. And riders are still waiting....and waiting....and waiting.... for it to be launched. Until the planner is launched, bus stop occupants can at least be entertained by people taking idiotic pictures in order to enter the "I want to be a tool in YRT's 'What's Your Number?' contest.